The most gratifying physics I’ve seen for a while comes in today’s Science magazine, from James Chin-Wen Chou and his colleagues in the Time and Frequency Division at the National Institute of Standards and Technology in Boulder, Colorado. They detect well-known effects of relativity on the rate of time passing, but now on the scale of ordinary human activities. Standard atomic clocks employ microwaves to ensure their regularity, but Chou’s team used laser light in a pair of aluminium-27 optical clocks (invented in 2005), which gives about 100 times better accuracy. In one experiment, they used an electric field to jiggle the aluminium ion at the heart of a clock and showed that time passed more slowly in accordance Einstein’s Special Relativity theory, about the effect of motion on time. The effect of atomic motion as slow as 8 metres per second (about 30 km/h) was detectable. Raising a clock makes it run a little faster. Credit: Chou et al., Science, 24 September 2010 – see reference. Especially pleasing for me was another experiment, in which one clock was jacked up just 33 cm relative to the other. 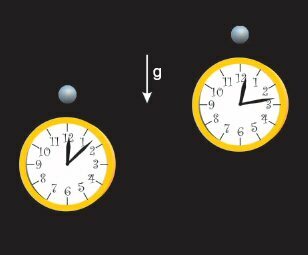 The clock gaining height ran faster because it was further from the Earth’s centre of gravity, and the gravitational field was slightly weaker, in accordance with General Relativity. As the change in clock rate was only about 40 parts in a billion billion (1018), its detection was a tour de force for the NIST team. This effect of altitude on time was the key to the efforts by Martin Freeth of BBC-TV and me to make Einstein’s theory of gravity, General Relativity, comprehensible to the public, in our film “Einstein’s Universe” (1979). Since 1996 the efforts of the French astrophysicist Jean-Paul Kneib to exploit natural lenses in the sky, created by the dark matter that surrounds clusters of galaxies, have fascinated me. While other stargazers used the “gravitational lenses”, bending light in the Einsteinian manner, to see galaxies far beyond the range of unaided telescopes, Kneib’s aim was to chart the mysterious dark matter itself. He wanted to see how visible matter and the far weightier dark matter have interacted through cosmic time – to see “the whole history of the Universe from start to finish”, as Kneib remarked to me in 2002. The new report not only gauges the cluster’s dark matter but uses the galaxies beyond it to infer the overall nature of space-time itself, dominated by the even more massive dark energy that drives the accelerating expansion of the Universe.